It was August 2016. 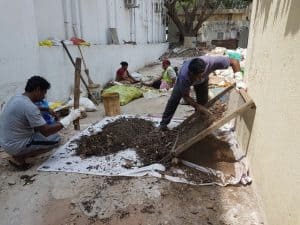 I chanced upon a Conservancy worker in Rail Nagar near Koyambedu segregating the ‘waste’ that was dumped into a plastic packet and suddenly found something like human excreta on her bare hands. I was shocked and asked how she got that. She said she had been asked by officers above her to separate the wet waste (mainly kitchen waste) and dry waste and put them into separate bins. I asked her whether the people who dump all their waste in one plastic bag would not segregate the different types of waste themselves if asked to, and her reply was in the negative. 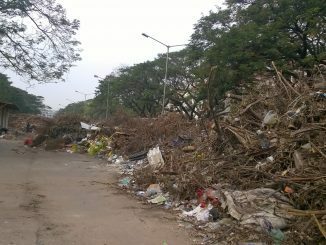 On one hand, we the people are hugely worried about manual scavenging and dirty cities, while on the other, we continue to dump diapers, napkins, cut vegetables, fruits, electrical items, worn out cellphone batteries – all into one beautiful plastic packet that we acquire after considerable bargaining with the shopkeeper. Most of the time, we don’t even realize that some individual would actually have to soil his hands with our babies’ poop. Solid Waste Management (SWM) or source segregation is one such topic which even the people who talk about it or actually DO it don’t understand. Yes, I mean it. For the past six months, I have been working in Ward 93 in Ambattur Zone, consisting of Wards in Mogappair, to make this happen. This is the story of my experience. When I first called the Assistant Engineer of the ward, she suggested that I talk to the Conservancy Inspector, who manages the conservancy workers and is responsible for a cleaner ward. The Inspector said they had been undertaking SWM activities in Rail Nagar within the ward, which consists of 500 odd houses. I went there and that’s where the conversation happened with the conservancy worker. Talking to her, I realised she did not have a very clear understanding of what she was doing or why. There were six cement bins into which she threw the kitchen waste while all other wet waste was being sent to the landfill. I got back to the Assistant Engineer and she in turn asked me to talk to the Assistant Executive Engineer and after a few visits, during which I convinced them about my intended mission, they were both very supportive. 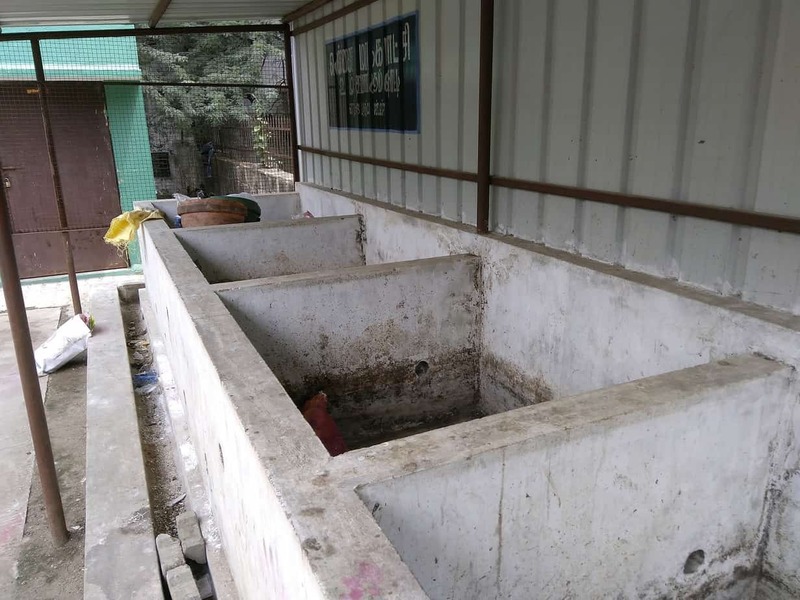 I was taken to a place where the Corporation had built an SWM facility consisting of a composting unit with four cement pits, but it had been largely non-functional till then. When I enquired about the reason, I found out that all the waste was being dumped at the site which led to a foul odour. The residents had naturally opposed and stopped it. I assured the Assistant Engineer that we could do better this time, and though there was a local political leader and his followers threatening to stall our efforts, their protests failed to take off. 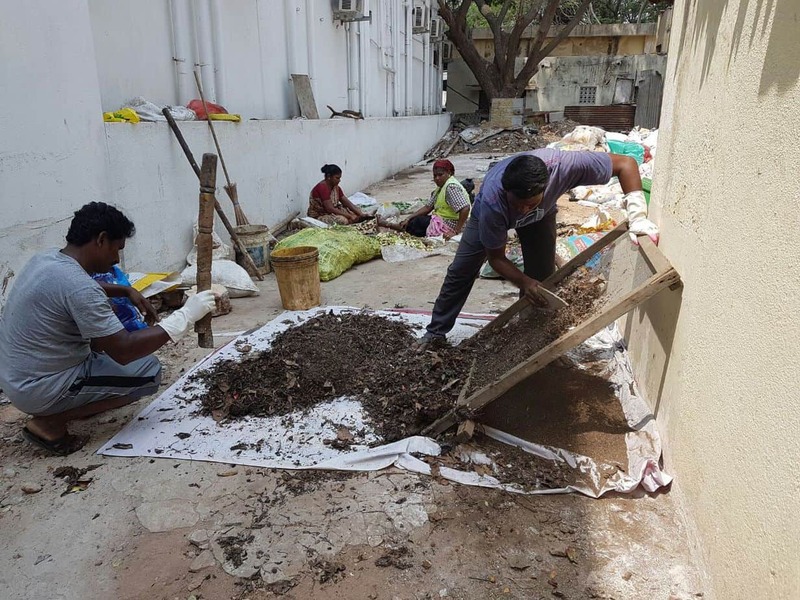 After a brief search, the municipal officials found a place along the Cooum lines, and we successfully started segregating and composting the waste there. Funds were a big constraint then, and initially we had to manage with broken bins. Meanwhile, the conservancy workers who had never been properly briefed about the rationale and principles of SWM, came up with rejected vegetables from the supermarkets instead of collecting them from households! I soon realised that the first thing we had to do was instil awareness among the people, both households and officials. As a pilot project, I suggested that we talk to 100 families about the need for waste segregation in their homes and then take it to the rest. The conservancy workers however were of the opinion that it would be difficult to change the mindset of the people. I figured out that we would have to start with whatever we had got and thus made a start. 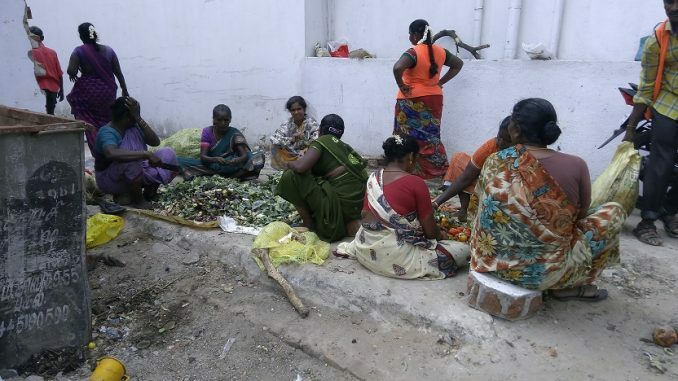 The workers who brought the vegetables from the supermarkets in the area cut them into smaller slices, and dumped them into some old bins that were readied for composting. The sailing was far from smooth initially. We had no covers for the bins so that when the rains came, they spoiled everything, and we were back to square one. We started all over again. After a brief productive phase, Vardah hit Chennai. This time the project was not only interrupted, but it came to a complete halt. Many of the uprooted trees were dumped on the bins, and that was the end of it. But even that would not deter me. This was also a time when there was some pressure on the officials as our ward was said to be faring the worst when it came to SWM. This galvanised us into quicker action and this time we started afresh in a place owned by the Corporation. Conservancy workers were pressured into bringing us all the garbage collected and we started weighing them. We brought cow dung as well. Since we did not have a vegetable shredder, it was always the workers who cut down the vegetables into smaller pieces so that the process of composting could be accelerated. Since the workers brought in more and more vegetables, we had to engage more of them to cut these manually. Soon we were preparing ‘beds’ everyday. Misconceptions still existed. There were those who did not understand the difference between worms and earthworms and kept thinking that we were engaging in vermicomposting (making manure from the wet waste with the help of earthworms). Some people said there was no need for dry leaves. I could sense a basic lack of optimism or confidence in what I was doing. Few seemed to believe that that all we needed to do was allow the veggies and fruits to dry and keep turning them, and they would turn to manure in 30-40 days. Even as various suggestions and apprehensions were doing the rounds, that is exactly what was happening. The wet waste was slowly turning into manure. We kept turning and drying the collected organic waste. And then one fine day, we got a mesh and we sieved them. This also turned many naysayers into believers. They started believing in me and in what we were doing. Today we have packets of manure from whatever is thrown away as waste. There are still challenges if the workers don’t show up or if the cutting is delayed. We have also started segregating the dry waste and exploring ways for the workers to earn out of that too. Though the government and the Corporation are keenly interested in a cleaner city, unfortunately the people — starting from the topmost official to the last conservancy worker — need awareness and training. To begin with, the roles have to be defined right. The Conservancy worker, after being given proper training, should be able to explain to theresidents the need for segregation at source. The Conservancy Inspector should ensure that segregated waste is collected by the workers and not mixed up during or after the collection. The Assistant Engineer should know the approximate quantity of waste (mainly organic vegetable waste) that would come out in a single day. The Assistant Executive Engineers and Executive Engineers should conduct more awareness sessions for the people. Just like a business unit, SWM can be a huge success if citizens, officials and conservancy workers can be inspired to work in tandem towards the common goal of reducing landfill waste. Our next planned step is to meet apartment associations and every household in the ward, make them aware and convince them to segregate waste in their homes. It will be a long haul, but I am optimistic. 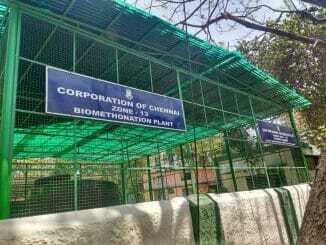 One day we will make our ward not just a garbage free one but also one which converts garbage into money. Jagadheeswaran D is a software engineer turned social worker, currently concentrating on solving issues in his municipal ward. The newly restored biogas plant in Ward 173 produces 6-7 kilos of gas per day. The fuel produced currently is used by the Amma canteen located in the same premises, which has brought down its LPG usage from 24 to 16 cylinders! They save trees from abuse in their free time, and you can too! 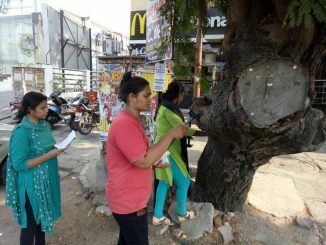 Through the month of April, volunteers of NGO Nizhal have been freeing trees of advertisement boards and other forms of constriction, thus gifting them a fresh lease of life.